Some people are dipshits. There isn’t a word in the English language that is better suited for them … DIPSHITS. For example the a**holes that sat around and decided to put together the profile above and send me a wink. 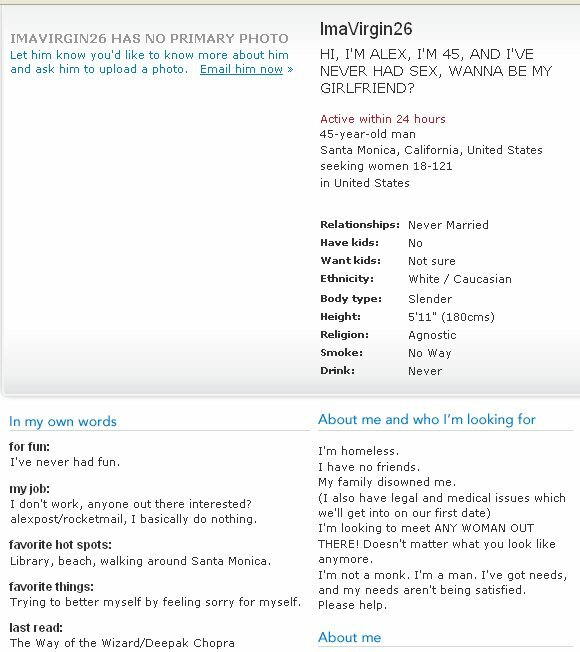 The only thing truthful about this profile is that the person(s) live in Santa Monica. There is a large concentration of dipshits in Santa Monica. This isn’t an opinion. It’s a fact. Ask anyone. Dipshits. I emailed them back (I assume it is a gaggle of dipshits who did this not one lone dipshit) and asked how they could possible have so much time to waste on their hands. Then I blocked them and turned them into Match.com for being dipshits. So I guess I’ll never know the answer to my question.